Erica Robinson is the creator of the Divine Life Goddess Body Weight Loss Program where she helps clients lose weight from a HOLISTIC perspective. She looks at weight loss from every possible angle - hormones, genetics, mindset, digestion, and inflammation so that clients can lose the weight and keep it off too. Erica’s holistic approach to weight loss is different than mainstream programs as those usually don’t address hormone imbalances and the consequence to that is long term thyroid damage aka burnt out metabolism. Erica encourages women to live what she calls a “first class life”. She says a lot of women (mothers, wives, business ladies) step into a second or third class life as they prioritize other peoples needs before their own and as a consequence they are unable to recognize their true selves. If you are interested in signing up for Erica's Goddess Body weight loss program, click here to sign up! #1- Not knowing when you are truly hungry, emotional eating (includes eating because you are stressed, wanting to distract yourself, because you are bored, or even just because there is food in the room and you are at a social engagement). 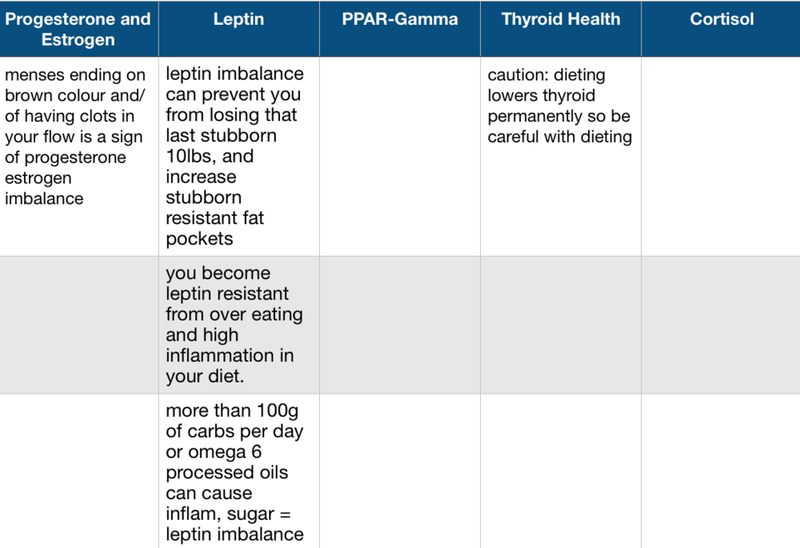 #2- Leptin imbalance - If you suffer from a “bottomless pit stomach” which means eating a meal and than wanting another meal right after. Lacking an internal cue to stop eating and just finish whats on their plate no matter what. #1- Distinguish true physiological hunger from emotional eating. True physiologic hunger can only be felt in the mouth and throat - the rumbling in your tummy does not necessarily mean you are hungry, it is just a sign that your migrating motor complex (MMC) is working and cleaning out your intestines. Think of it this way: If you were to put shoes in the dyer by themselves it would sound very loud. But if you were to put shoes in the dryer with towel and clothing you wouldn't hear the noise to the same degree. This is the same for the MMC. When you have no food in your stomach aka you are fasting you will hear and feel the sounds louder. Feeling "hangry" is also not a sign of true hunger, it has more to do with your blood sugar levels crashing. #2- Connect mind to body. many people suffer from a disconnect and their mind isn’t really connected to their physical body - once you make the connection you can recognize when you are full, gain control over external cues like husband eating or the clock, its okay not to eat at regular meal times. #3- Intermittent fasting - holiday dinner - fast all day before and then when they go out for dinner they have true hunger. intermittent fasting: 2 days a week for 24 hour fast if you can, and confined feeding window to 8,10, or 12 hours of not eating. #4- Increase lean muscle mass - the more muscle you have the more calories you burn at rest. #6- Don't do excessive cardio. cardio can burn adrenals if you have a thyroid issue - no more than 20 mins of cardio per day. Instead do HIIT - 30 seconds hard, 90 seconds rest 3 times per week. burpies, sprints, etc… one round first week and work your way up to 10 rounds so by week 10 you can do 10 rounds of HIIT. Strength training 4 times per week for 30-40 minutes - should never feel depleted after working out. exercise reccomedations - HIIT, weight training. - muscle building for women: we can only gain half a pound of muscle a month vs men who can put on 2lbs a month. - Not real hunger = blood sugar crash, “hangry”, moody, stomach growling - not good cues to eat food. - herbs that protect the adrenal glands: “adaptogen herbs” = Siberian ginseng, Rhodiola, Ashwaganda, Holy basil (also safe while breast feeding) - and great for metabolism, nourishment, and support hormones. - Being over weight can take 3-14 years off of your life (national institute of health). - The average north American spends an average of 10 years in their "morbidity window". - You can get 9 and a half years of your life back if your achieve your healthy weight. For more Healthy Holmes interviews and all things health and wellness, check out my social media platforms to stay up to date and follow me on my journey to optimal health and quality of life. Newer PostHow Mike Holmes Jr. & I Saved Big On Our Wedding Day.